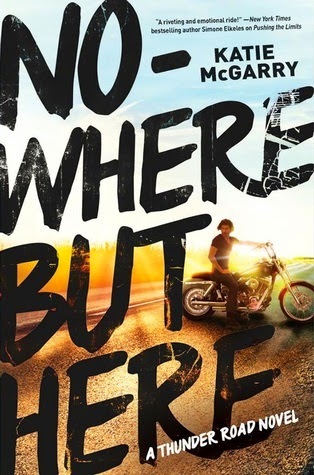 My Thoughts: I wasn't really sure about reading about a motorcycle club at first. But, if anyone can pull it off, its Katie McGarry! We are introduced to Emily who lives with her mom and her adoptive dad. Emily was adopted pretty young by the man her mom married. She’s had a pretty average life. A few friends, school, and a family. She has spent a little bit of time with her real dad over the years but not much. He has come to visit her. We are also introduced to Oz who lives near Emily’s dad. Emily’s dad is part of a motorcycle club called “Reign of Terror.”A lot of people fear them. The Reign of Terror also run a security company. Well, when Emily finds out her grandmother (dad’s mom) died, she goes back to his hometown for a wake. She not thrilled about it but she’s always been a bit curious about them. Emily gets a lot more than she bargained for. She finds out there is much more to this family than she originally thought and her mom hasn't been completely honest. And, I loved Oz. Bad boy Oz. Even though he’s classified as a bad boy he really isn’t. He’s sweet and loyal. I also really liked the rest of the members we meet of Reign of Terror. So many side characters with such distinct personalities. I wasn't sure if I would enjoy the whole motorcycle club thing, but I did. It worked well. I liked hearing about all the backstory for these characters. I want to say so much about this book but I think you should read it for yourself. I really liked Emily and Oz. I even liked Emily’s dad. And, I liked everything that happened (even the sucky stuff, because it still fit). Overall: Another cute but deep story by McGarry! I just love the books I've read by her so far! Loved Oz and Emily and the rest of their crazy families. Also loved learning more about the motorcycle club. Probably more of a 4.5 cupcake rating! Cover: Super nice. Love it! The colors even work. Like it a lot.